Last month, we offered suggestions for how to plan your gift giving and get ahead of the curve, but for those of you who didn’t have time to heed our early bird tips, there is still a silver lining. You’ve waited just long enough to get a special deal on shipping. From now until December 15th (the last day we can guarantee that your packages will arrive on time), we are offering free ground shipping within the continental U.S. for any orders over $50 in value at The Olive Oil Source Boutique. Olive oil is one of the healthiest foods on the planet. So, we can’t think of a better way to wish friends and family “Best of Health in the New Year”- and show you really mean it - by gifting them this super food of the ages. The Olive Oil Source Boutique has a wide assortment of holiday-themed gift ideas - from the festive holiday gift sets to perfectly versatile gift certificates and our sampler collections that make great stocking stuffers. Our new and very special line of kosher extra virgin olive oils will help you celebrate Hanukkah with family and friends by giving the same “gift of light” that has graced tables for years. From our many Christmas and Hanukkah blends, you will find seasonally-inspired products with holiday labels to match. 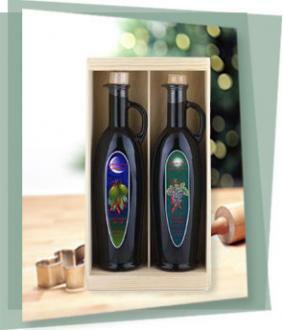 Our Figueroa Farms Oil and Vinegar Holiday Box celebrates a mild and fruity blend of Extra Virgin Olive Oil of Leccino, Frantoio, Pendolino, Maurino and other Italian varietals. It pairs perfectly with the Figueroa Farms Holiday Balsamic Vinegar from Modena Italy. The Olive Oil Source Six-Pack Basket is a perfect way to introduce your friends to a great mix of flavored oils and vinegars. Or, create your own sampler set from our entire line of extra virgin olive oils and vinegars and host a “tasting party” that no one will ever forget. For those people you know who would rather relax through the holidays than cook up a feast, treat them to wonderful Marius Fabre olive oil soaps and lotions from France, or a gift set featuring the award-winning book, The Passionate Olive. So, visit us online and solve all your holiday gift-giving problems. And take advantage of free shipping for any order placed by December 15, 2011. It’s our small way to make last minute decisions easy.